I love this rib recipe because Glee and Huan love ribs and I can easily prepare these in advance. You can pre-bake the ribs and prepare the sauce and just refrigerate them. When it comes time to eat just toss the ribs in the sauce and broil them for 5-8 minutes. 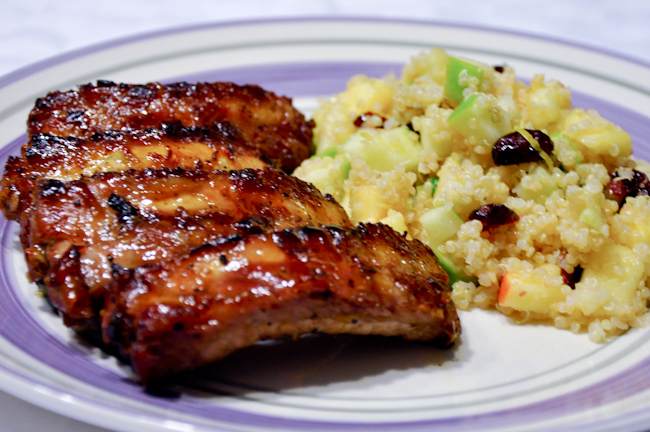 I paired these ribs with the cranberry apple quinoa salad because the tartness of the apples balanced off the sweet honey garlic. Making this meal finger licking good! These ribs can also be served as part of an hors d’oeuvre at a cocktail party as it is individually cut.